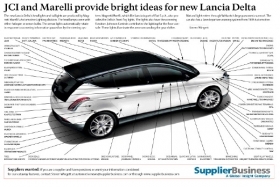 The new Lancia Deltas headlights and taillights are produced by Magneti Marellis Automotive Lighting division. The headlamps come with either halogen or xenon bulbs. The xenon lights automatically rotate in response to cornering information passed on by the steering system. Magneti Marelli, which like Lancia is part of Fiat S.p.A., also provides the Deltas front fog lights. The lights also have the cornering function. Johnson Controls contributes the lighting for the floor console. These lights illuminate the area surrounding the gear shifter. Natural light enters through Webastos large panoramic sunroof. The car also has a lane departure warning system from TRW Automotive.